Day of the Dead (Spanish: Día de los Muertos) is a popular Mexican and American – Mexican Holiday. When people remember and pray for their lost family members and friends. Day of the Dead is celebrated two days after Halloween. In U.S, people celebrate Day of the Dead by elaborate outdoor altars commemorating deceased loved ones. Day of the dead is to celebrate both Life and Death. This Day of the Dead dress up in your favorite costumes to pray for your loved ones. 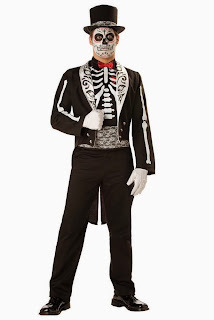 Embrace the spirit of your lost friends & family members in this Day of the Dead Groom Adult Costume. This amazingly detailed exquisite costume is surly going to turn head the costume party you enter. This Costume includes Shirt/Cumberbund, Jacket, Hat/Mask. Pants, makeup and gloves are not included. Care Instruction: Machine Wash Cold, Gentle Cycle, Tumble Dry Low, No Bleach, Cool Iron. Description: Includes: Shirt with attached bowtie and cumberbund, jacket and hat with attached mask. Does not include pants, makeup, gloves or shoes. 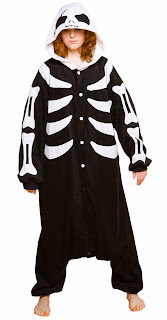 Don’t want to get into the fuss of buying and carrying off costume, pick this Skeleton Hoodie Adult Costume for comfortable Day of the Dead Celebration. Available in Adult Sizes: Small, Medium, Large, and X-Large. It’s simple yet scary. This Dustin Bones Costumes is surly going to scare your Friends & Family on the Day of Dead. 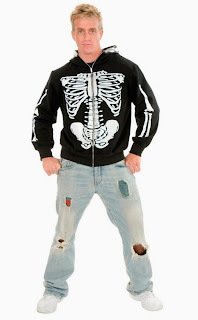 This costume includes a character print zip front hoodie and a matching skull bandana. Does not include pants or shoes. You will be one of the most “beautiful” skeletons when you step out in this Ladies Skeleton Hoodie Sweatshirt. This costume includes: Hoodie. Leggings and shoes are not included. This is baggy costume is surly going to give some light moments when your enter Day of the Dead Celebration. This costume includes button-down jumpsuit with attached hood. Nothing is sexier than this Bone Tank Dress for Day of the Dead Celebration. This costume Includes dress. Does not include shoes. Get yourself dressed in one of the above fun & scary Day of the Dead costume to remember your dear ones.